An every day, soothing, softening and balancing toner to complete the cleansing process, ideal for all skin types including sensitive. Light hydration is offered by the inclusion of Panthenol while the anti-oxidant protection comes from Green Tea. Sodium Gluconate assists cell turnover and hydration, leaving a clean and powder dry after-feel. Sodium Gluconate - Superior non-irritating conditioning agent that moisturises, balances and assists cell turnover. Panthenol - Also known as Vitamin B5, an emollient and moisturiser, it makes the skin softer and more elastic. Green Tea - Rich in antioxidant properties, also a natural preserving agent. Aloe Barbadensis Leaf Juice, Water (Aqua), Polysorbate 80, Hamamelis Virginiana (Witch Hazel),Water, Sodium Gluconate, Sodium Lactate, Benzyl Alcohol, Sorbitol, Phenoxyethanol, Panthenol, Cananga Odorata Flower Oil, Disodium EDTA, Camellia Sinensis Leaf Extract, Benzalkonium Chloride, Methylisothiazolinone, Linalool, Benzyl Benzoate, Farnesol, Benzyl Salicylate, Geraniol. When I received the item I found the lid is broken and half of the liquid is gone. It is really annoying. Really bad shopping experience. I think it would be better buy the Aesop product from their official website. I emailed them and they only promise to refund 20%. I always think it would be better to use all skincare from one brand. And this toner does its job when i use it combined with the parsley seed serum. It helps the absorption. Smells good. they delivered the parcel very fast when they knew its broken on the way . It is the second time I use it.I like it very much. The tones is effective on softening and soothing. But oil still appears on my T zone, the demerits of the item. My skin is a little oily,and I have used B & Tea Balancing Toner for a several days, the smell is not nice, the effect is not obvious now, and I am still waiting for its effect on my sensitive skin. Good Toner for combined to oily skin. 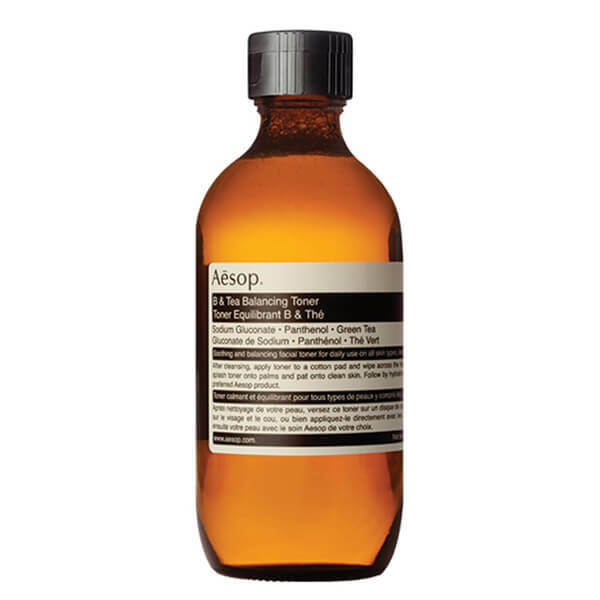 I love the tea flavour, I love Aesop.